Photo provided by the Miraflores Presidential Palace shows President Nicolas Maduro, second from left, and first lady Cilia Flores during a event marking the 81th anniversary of the National Guard, in Caracas, Venezuela, Aug. 4, 2018. A former top Venezuelan security official says video reports from Sunday's drone attack on President Nicolas Maduro demonstrate serious shortcomings in the response of the bodyguards protecting the increasingly embattled leader. "Maduro's security was shown to be deficient," said retired Venezuelan Vice Admiral Mario Carratu, who has headed security teams for previous Venezuelan presidents, in a telephone interview with VOA. "His bodyguards were slow to react and seemed to lack an evacuation plan for the president." Carratu said video of the incident, in which two drones exploded near a reviewing stand without injuring Maduro, suggested the president's security detail did not have an effective evacuation plan in place. The former admiral's analysis dovetails with public comments from disaffected former Venezuelan military officers who have gone public with claims to have been responsible for the assassination attempt. "We showed that the regime is vulnerable. We didn't make it, but it's a matter of time before we do," said Salvatore Lucchese, a former Caracas police chief now in exile. Venezuelan opposition activist Salvatore Lucchese speaks during an interview with Reuters in Bogota, Colombia Aug. 6, 2018. Lucchese claimed to have been part of the plot in an interview with Reuters this week in which he called for an armed overthrow of Maduro's leftist regime. Maduro was addressing a ceremony of the paramilitary National Guard in central Caracas when he came under attack from two drones packed with explosives. The government claims that one of the drones was diverted electronically while the second crashed into a nearby apartment building. Carratu confirmed that Venezuela, a longtime ally of Cuba, has the technology to electronically penetrate and interfere with the electronic signals of aircraft. But he ridiculed claims made on Twitter by persons saying they were involved in the attack that the drones had been shot down with firearms. "Plastic explosives can't be detonated with bullets. They more likely exploded prematurely due to poor preparations by the hit team," he said. Lucchese's claim of responsibility for the attack came Wednesday but could not be independently confirmed. Responsibility has been claimed by a confusing array of spokesmen purporting to represent former and active members of Venezuela's security services, going by various names including "The Resistance," "Fenix Group" and "Soldiers in T Shirts." Lucchese was jailed by the Venezuelan government in 2014 for refusing orders to suppress opposition protests in his city. He took up political activity upon his release in 2016, when he objected to political negotiations with Maduro, but fled the country shortly afterward to avoid being arrested again. He did not reveal his location in the Reuters interview, but members of the Venezuelan government assert that he is in neighboring Colombia, a country that Maduro accuses of backing attempts to topple him. Exiled Venezuelan opposition journalist Patricia Poleo, long known for her close connections with the military, broadcast a statement from Miami that she claimed had been issued by officers in Venezuela. It said the officers were resorting to "armed struggle" because "the regime has consistently ignored the constitution." Some opposition leaders have cast doubts on the claims of responsibility, suggesting instead that the attack was staged by the government to justify further repression. 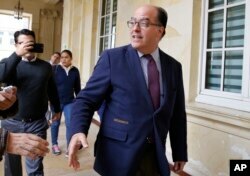 Julio Borges, president of the Venezuelan parliament, arrives for a meeting with Ernesto Macias, president of Colombia's Senate, at the Congress in Bogota, Colombia, Aug. 8, 2018. The Maduro government this week has rounded up a half dozen military officers it accused of conducting the attacks and has issued arrest warrants for at least two opposition leaders, including congressional Speaker Julio Borges, who is in Colombia. Lucchese's police background crisscrossed with that of police lnspector Oscar Perez,who last year attacked Venezuela's Supreme Court from a helicopter with hand grenades and machine-gun fire. The attack came as the court's seven judges assumed the powers of parliament to allow Maduro to rule autocratically. Perez also machine-gunned a building housing Maduro's new handpicked national assembly, which had just ousted Attorney General Luisa Ortega for accusing Maduro of corruption and authoritarian rule. The Caracas metropolitan police, which has been largely dissolved by the Maduro government, maintained close links with opposition leaders. Lucchese was a member of the same Christian democratic First Justice party as Caracas Mayor Leopoldo Lopez, one of the most charismatic anti- government leaders who has been repeatedly imprisoned by Maduro. Perez was a subordinate to Lucchese in the police criminal investigations unit and the special operations brigade. He was killed by the new national secret police, SEBIN, whose forces used rocket-propelled grenades against his safe house when they raided it some months ago.